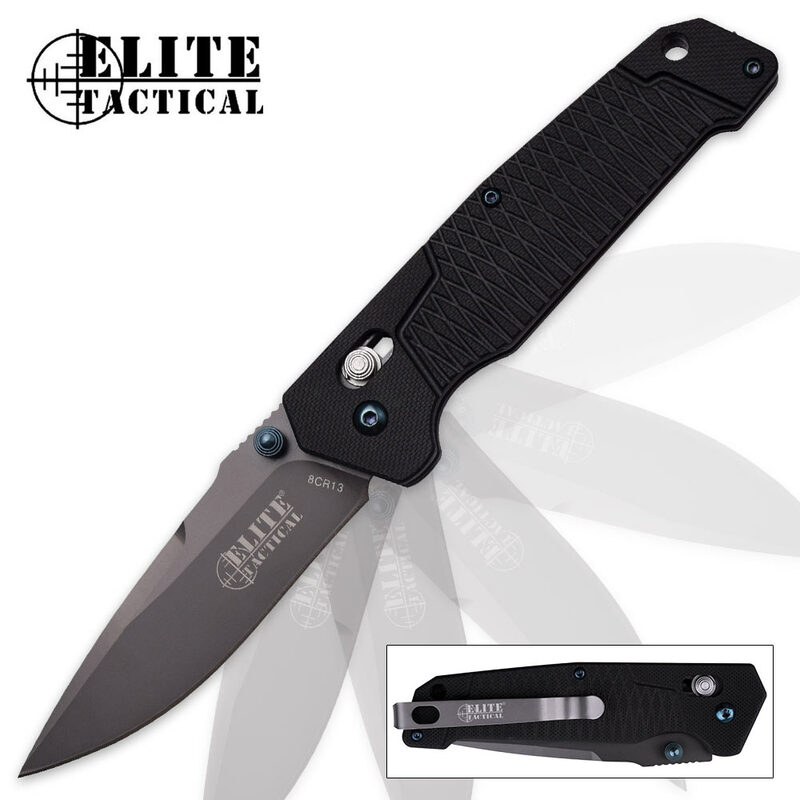 Elite Tactical Ghost Point Pocket Knife - Ball Bearing Pivot - G10 Handle - Rapid Lock | BUDK.com - Knives & Swords At The Lowest Prices! 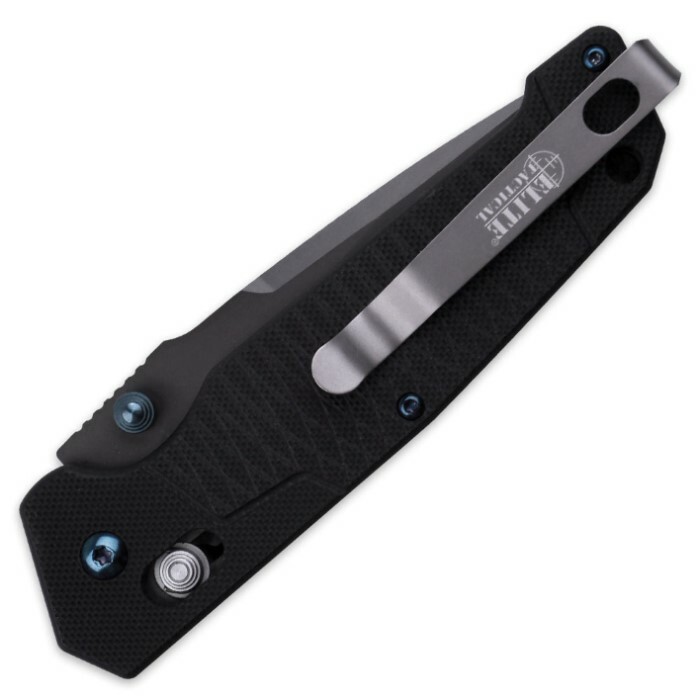 Smartly designed and carefully crafted using the most advanced materials available, the Elite Tactical Ghost Point Pocket Knife is ultramodern and well-adapted to the unique challenges faced by contemporary soldiers and extreme outdoorsmen. With its unbelievably affordable price however, you don't have to be black ops or a death-flirting survivalist to justify adding the Ghost Point to your arsenal. From far-flung, remote back country to quiet suburbs and every locale and environment in between, the Ghost Point is a superb choice that's up to any cutting task. Its sleek 3 1/2" drop point blade offers unmatched versatility, ideal for skinning, piercing, field dressing small game, slicing, carving - the list goes on. Forged from hyper-resilient 8CR13 stainless steel with a discreet nonreflective titanium nitride (aka "tinite") coating, the blade is carefully honed to razor sharp and stays razor sharp through even the most punishing chores. The Ghost Point's cutting edge, velvety smooth ball bearing pivot action makes fast, one-handed blade access easy, requiring only a nudge of one of the ambidextrous thumb studs and a gentle flick of the wrist. Once opened, the rapid lock mechanism kicks into gear, grabbing and firmly fixing the blade for added safety and stability during use. Release the blade with the simple, easy-to-access rapid lock switch on the handle. And speaking of the handle, the Ghost Point's is outstanding. It's made of innovative G10, which boasts an otherworldly strength-to-weight ratio. The Ghost Point's G10 handle is subtly textured for an incredible, delightfully tactile hand-feel and a sturdy, no-slip grip, even in wet, challenging conditions. Impeccably balanced, the Ghost Point is remarkably easy to manipulate with grace and precision, and the built-in pocket clip makes transport literally a "snap." The integrated lanyard hole offers an additional carriage and/or tethering option. You can spend a lifetime replacing cheap, flimsy folders, but the Elite Tactical Ghost Point is guaranteed (by the manufacturer) for a lifetime of dependable service. And at this price, why not go professional grade? It's time to stop the annual second-rate pocket knife turnover. Order the Ghost Point and be set for a lifetime and beyond! I must admit I was a bit skeptical of the claims made in the promo/description associated with this blade. However, for the price, I decided to give it a go and evaluate the quality and performance for myself. WOW! does not do justice to the quality of this blade. 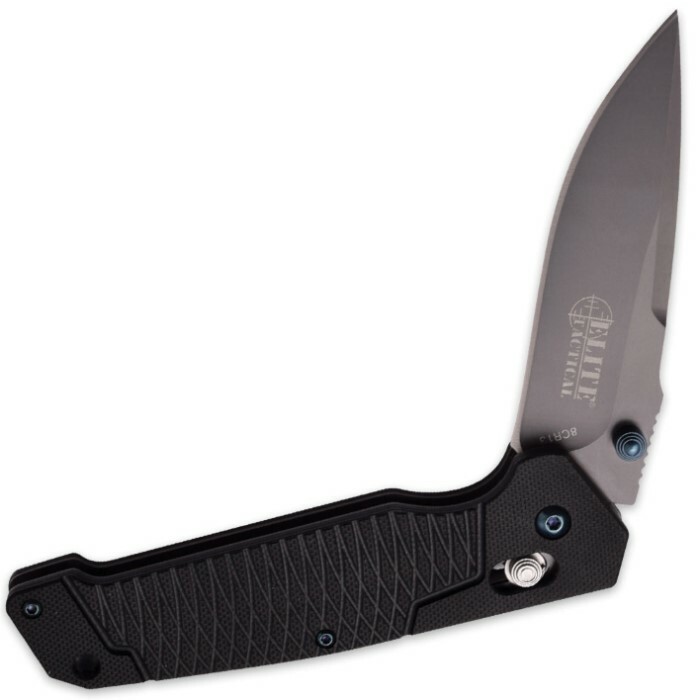 It is NOT advertised as an assisted opening blade, but the smoothness of the ball bearing pivot on this knife is nothing short of phenomenal -- with only a moderate flick of the thumb, the blade flies open to full battery and locks solid. The opening action is smother than some of my more expensive assisted opening knives. The locking mechanism is rock solid. The blade arrived RAZOR sharp right out of the package. Overall, the knife is relatively light and fits well in the hand. Without exaggeration, the quality and performance of this knife EXCEEDS what would be expected of a much more expensive product. I will definitely be ordering other Elite Tactical knives in the future. This has proven to be one of the best value purchases ever. Thanks BUDK and I can only ask that you guys expand the selection of Elite Tactical knives.